The Chemsplash® Cleanroom Overboot is suitable for ISO Class 5 (Class 100) Cleanrooms and critical environments. 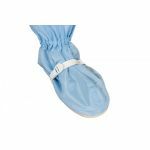 The Overboot is manufactured with an Antistatic Polyester and a custom Nitrile Rubber moulded cleanroom sole (Chestat 939G plus). The heel and toe areas of all ChemStat 939 soles are reinforced to resist premature wear. Raised bumps on the exterior of the bottom of the sole reduce hydrodynamic slippage when fluids are present on tile or perforated floors. ChemStat 939G Plus soles should be used in cleanrooms with smooth tile floors conditions. For quality control purposes, ChemStat 939G Plus soles are cream coloured and are stamped with the identifier ChemStat 939G. The Antistatic Polyester material has twin needled stitching and all edges are heat sealed. Incorporating elasticated ankles and tops to provide comfort and a safe fit. 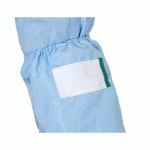 The low linting garment is suitable for Autoclaving, Gamma Irradiation and Industrial washing. Available in Blue and White, and flexible sizing between XS to XL.